Swam with the Hammerheads Today! Thread: Swam with the Hammerheads Today! I will be refraining from slug shooting today, as, during our morning walk across the pasture, my hound peed on the "don't shoot slugs today" tree. Centerfires are okay, but slugs would be a disaster. So what's his name? Looks like a pretty good dog? Here's #1 for me. The mould ran so good I made 92 of them. Strait Wheel Weights and 486-489 gr. with Sabot. Sabot is 77 gr so Slug is 409-411 gr. I thought these were supposed to be more like 500 gr? Does strait lead make that much difference? Can't wait to get the A5 back from Art's Gun Shop. Expecting great things. I'm guessing your Lee slug mould question was aimed at me (no pun intended!)? My current plan is to sort out stem diameter to suit a decent size wood screw (#6 or maybe #8?) then drill the core pin to the bottom of the drive key slot then taper ream so it will release okay. For short term use I'll simply drill a starter hole using my lathe but if the Lee/Brenneke (BrenneLee? or maybe Leenneke?) shows promise I'll add a spike to make the starter hole. That works well on my push out moulds. I will leave the drive key as It won't be easy to fill I don't think though one poster used an epoxy with success though I suspect it will gradually burn out or break down from the heat. I can make a core pin for a push out mould if I don't want the drive key. I'll leave it also because it does keep wads out of the cavity. With an attached wad system these will be nose heavy regardless. I'm thinking 2 x 1/4" felt wads screwed on and with stiff leather or plastic washer top and bottom to protect the felt. I'll post pics when I get done. Right now I am working on modifying my rifling cutter. I let it soak in vinegar for a day and that did sharpen it up but the life was short lived so I'll go to a hook or scrape type cutter to finish off the choke tube. I'll make a face I can touch up with a diamond hone. Looking at those Hammerheads I would think they'd shoot okay from smoothbore but apparently not. I guess just not enough nose forward weight. I'll agree with you on machining a solid attached wad... that is with no cushion leg. I think that should make the Hammerhead better by eliminating the cushion leg which must distort some at least. okay then they aren't really solid but they don't have a cushion leg to distort. I like AQ's as much as Brenneke's! No reason a Hammerhead slug on a solid attached wad shouldn't be very accurate. They seem to do pretty well as is... at least when it is windy! Thanks, he is a great dog and his name is Laurel. A year ago, I was volunteering at the local adoption center. I worked in the big dog barn and met him there. Big dogs don't move and he really tugged at me every week so, I took him home. Looks great! Reference the load card the total ejection weight should be 490-grains. I cast mine with 6/4 linotype/ww and the total is 472-grains. Well, I have hogs. Given their arrival time, I will need to see them several nights in a row to make sure they are consistent. That is a late sit! It will be a 75-yard shot. Next two nights we have heavy thunderstorms forecast so will see where they are after that. Randy, I’m pouring mine with pure lead. I haven’t weighed them yet but they shoot good out to 50 and all are inside a paper plate at 100. 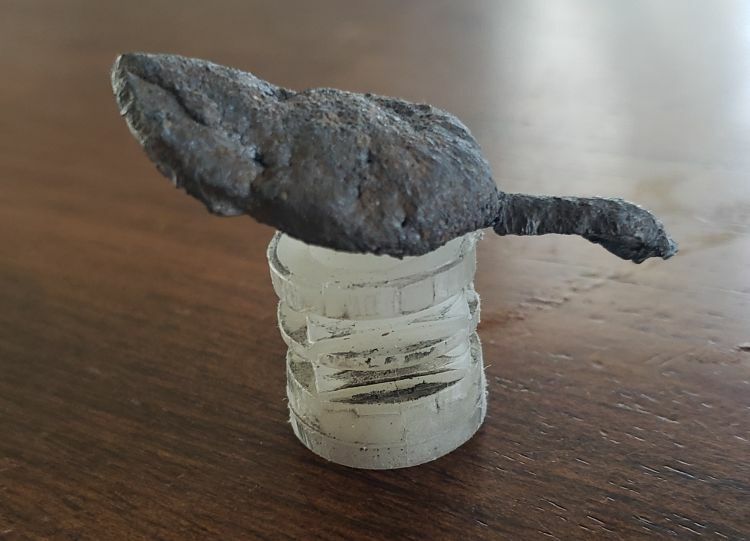 While shooting my SMLE scout rifle Friday, I saw a Hammerhead laying in the rubble that was generated from the 303 British bullets striking the berm. I didn't weigh it but think any loss is negligible. I can notice some rotation on the "shaft" of the slug. It would be impossible to know if that is slippage while in the barrel, enroute to the target, or at sabot ejection. I do find almost all of the sabot's laying on the berm. A week or so ago, I was walking down my shooting range and at about 150-yards, I found a spent Lightfield. The only one that I know of that didn't go into the berm was possibly the one shot I made at my steel target (100-yards). I bet that projectile sounded like a buzzsaw! Last edited by Ranch Dog; 12-09-2018 at 10:51 AM. 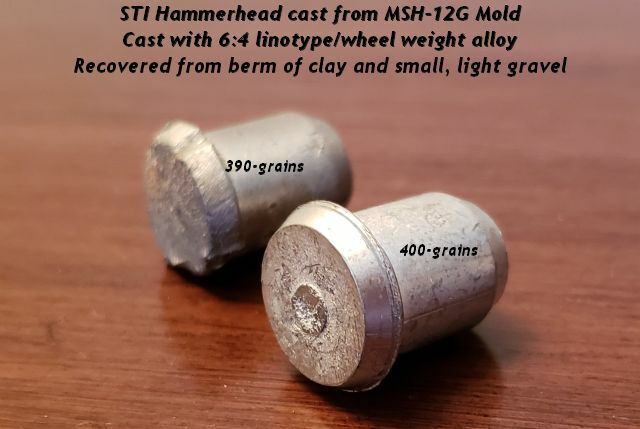 Reason: Updated Hammerhead pic to include fresh cast sample and weights. Mike I'd be interested to know if there is a velocity drag penalty from the non discarding style slug VS a standard foster style. I'd imagine the penalty would be slight at 100. Be fun to know if there is a formula. It would be tough to measure. The difference is negligible. The non-discarding tail hurts the slug tremendously compared to a plain base slug/bullet, but is on par with a hollow base foster. A good comparison is the LBC sabot. Both sighted in at 100 yards, a sabot slug like the SST at 2000 fps will drop 10"-12", the LBC at 2000 fps will drop 30"-36". A foster slug like the truball at 1600 fps, will also drop about 30-36". Inside of 100 yards, even a round ball is within it's point blank range (plus or minus 3") if shot at over 1100 fps. I do enjoy the trials involved with pushing the envelope. Development does carry a price tag in every avenue of progress. Then the thought just occurred to me... I am so thankful I have river bottoms to slink about. Our corn cruncher this year was taken at the extreme distance of 25 yards with a bow. So how about a "cylinder shape" slug powder coated to whatever diameter so it is groove plus ? No slipping or at least minimal.. No expensive sabot to discard. Maybe even a round ball. This may have been run already and I missed it. Sadly down here there I have no rifled barrel to try.. Guberment gets testy seeing certain items in a suitcase.